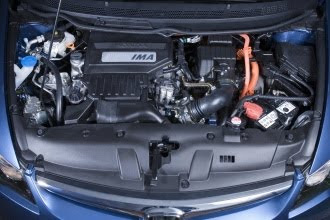 This is the second in a series of posts about our Honda Civic Hybrid, which we’ve been running since September last year. In our first post we looked a little at car finance – particularly at the all-important questions of value for money and depreciation. This post is more in the same fiscal vein. Fuel is probably the next most obvious cost, given that you have to stare at the numbers reeling upwards at an alarming rate every time you visit a petrol pump. In our ten months with the Civic we’ve never managed to equal the 61.4mpg official combined cycle score. Our results haven’t been too bad, however. Around town we typically manage 40 to 45mpg without much effort, while on a motorway trip we usually see 55 to 60mpg according to the in-car trip computer, which is pretty accurate when compared with our costs at the pumps. We were quite surprised at how much the consumption varies with tyre pressures, so it really is worth checking each corner at least once a month. We were gobsmacked at the variability in quotes for insurance. The Civic Hybrid fits in group 7 so shouldn’t cost an arm and a leg, but The AA wanted both limbs. It quoted us more than twice the amount asked for by the lowest quoter, Admiral. It really is worth comparing the meerkat. Asking Aleksandr saved us £600. Our car arrived with 13,000 miles on the clock, and six months later at 18,000 it was time for a service. Browns Honda in Loughton proved to be polite and efficient although severely lacking in parking spaces. Having parked under a no-parking sign, we handed over the keys. 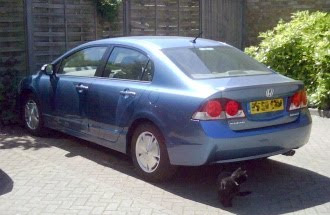 Later in the day, Browns gave the car back to us in beautifully clean condition and relieved us of £241 including VAT. Of that, £58 went on fully synthetic oil, £37 on fluid for the CVT gearbox, an astonishing £47 went on air filtration, and £80 on labour. A new oil filter and waste disposal, plus the inevitable splash of washer fluid, accounted for the rest. All told we’re on course to spend about £1,750 in direct costs in our first year with our hybrid – its second year of existence. Depreciation will push the tally up to £3,000 or about 30p per mile. All of which sounds horrendous, but is actually not bad, as running costs go.